ከላይ ስማችሁን እንጅ ግብራችሁን የሚገልጸውን ማንነታችሁን መደበቅ ያልቻላችሁት 2 አስተያየት ሰጭዎች ፤ ስለዶግማ መግለጽ የሞከርከው ፥ ለመሆኑ ዶግማ ማለት ምን ማለት እንደሆን የምታውቀው ነገር አለ ? የትኛው ነው ሥርአተ ቤተ ክርስቲያንን የማይጠብቀው ? 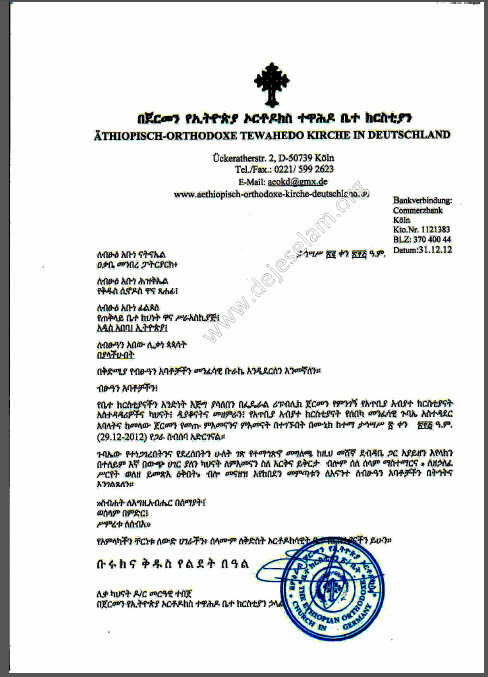 በፓትርያርክ ላይ ሌላ አርትፍሻል የመንግሥት ካድሬን ፓትርያርክ ብሎ ቤተ ክርስቲያኒቱን ከሁለት የከፈለው ነው ወስ በግፍ የተሰደዱት አባት ይሚመሩት ሲኖዶስ? ''ሲኖዶስ የሚወስነውን ሁሉ በፀጋ መቀበል ነው '' ያልከው ወገንም ተሳስተሃል። ቀኖና ቤተ ክርስቲያንን የማይጠብቅ ሲኖዶስ የሚወስነውን ውሳኔ እንድንቀበል የሚያዘን የቀኖና ሥርአት የለም። ለሕገ ወጥ የመንግሥት አገልጋይ ሲኖዶስ መታዘዝ በራሱ እንደ ፀረ ቤተ ክርስቲያንነት የሚያስቆጥር ነው። ስለዚህ እውነተኛ የሆነው የቤተ ክርስቲያኒቱ ልጆች ግን የወያኔ አገልጋይ ሁኖ እርቅና ሰላምን ረግጦ በጉልበት እየመራ ያለውን ሕገ ወጥ ''ሲኖዶስ'' በስሙ ብቻ እውቅና አንሠጠውም። የሚሾመውንም ''ፓትርያርክ'' አንቀበለውም። በማንና ለምን አገልግሎት እንደተሾመ ጠንቅቀን እናውቃለና ! እንዲያው ምን አለ አንዳቸው ቢሸነፉ? ለማን እንናገር ምን ብለን እንጻፈው? ሞቶ አልነበረም ወይ ሞትን ያሸነፈው! "be mejemeria le hegu sannegeza, endet new tiru abbat menefelegew?" So called "Neutral/gleltegna" Churches, first follow the church cannon laws your self if you want others to follow the church's law. Our Lord taught us to teach by patience and example. I truly do not understand how those who do not follow the law try to tell others to follow the law. I do not understand. I do not understand how one can fight an enemy who is in his house from the outside? If you want the enemy to leave, go INSIDE AND FIGHT. This is what is missing today, NO ONE, wants to sacrifice (their lives, marriages, jobs, reputations, families, money, fame, education) and go IN (sereat / church admin order) AND FIGHT. This is true both spiritually (our church); socially; economically; and politically. We lack the true pride of our fathers who fought the true fight and won because they fought risking they can lose everything they have, we fight too but we want to keep the things I mentioned above (our livelihood). Our pride is NOT based on our fight to preserve the heritage of our church and country, but we have a superficial pride based on the achievements of our past, we pride on our history but seek not to make it ourselves just like our fathers... I am also guilty of this false pride, we do not realize the huge responsibility we have, and that history will judge us one day. When my 1 year old daughter grows up one day she might ask me, "Father you were alive during this terrible time in our church and country's history, what did you do?” Am I going to tell her I was a coward? Am I going to tell her I didn’t want to get involved because so and so was Patriarch and so and so was in government, will that be a good lesson for her? I do not know much, but I know that it's by sacrifice (even unto death) our church and country WAS established and CAN continue to exist, there is NO freedom of spirit and body without blood. Blood is received only on the battle field; the battle field is being within the church’s administration, this is one of the areas the devil fights us, avoiding it gives the devil SURE VICTORY…what is the use of joining the administration after there is peace if we failed this test ? Forgive me; it’s what I learned from my fathers. Lets all have faith and serve according to our grace and leave judgment at the door. I think there is simple solution for this why don't you choose Eritrean pope for the 6th Ethiopian Orthodox pope then God knows for the next. May our lord Jesus Christ bring our country & specially our church the much needed peace, reconcilliation & togetherness... It is only the Holy Trinity who can help us bring about peace & unity. Those of us who serve in the church know & are always reminded by the gospel of St. John (6:26) that we who partake in the covenent dwell in Christ & he in us. Knowing this, it is apparent that we are all one in Christ. The earthly power seem to have affected our fathers & hence our mother church that it make some of us silently sad. Let's be reminded of what our northern brothers (ofourse the Egyptians) have done and perhapse lean from them some of the strengths that Christians should have... we atually do not need to go that far..let's learn from our fallen fathers like our beloved martyr His Holiness Abune Petros! Please, let us also stop rebuking each other and try to find ways of reconilliation of all Orthodox Christians as we are one. May the kindness of the Father, the love of the Son and the unity of the Holy Spirit be upon us all. And May God bless Ethiopia & Tewahido. Amen. The point is made clearly but, my brother did not understand history of either the determination of the Egyptian christian brothers or the sacrifice His Holiness Abune Petros made for us all. This is not about WOYANE or any earthly entity but, about the preservation of our christianity and oneness. Remember one fact... Haile-Silasie was there & perished, Mengistu was there & did not last... and now Woyane will go in due time! but, our heavenly Jerusalem (our mother Tewhido church) will live on forever and lets mend our differences and make a pleasant road ahead for her. Beloved brothers and sisters, do not dwell on the short lived earthly kingdoms & widen our differences but, let us help our lord dwell in us as John 6:56 instructs & become one in him and minimize or eliminate our differences.... make no mistake! this is not about woyane... woyane will pass too but, our lord & the mother Tewahido Churh won't! kiristian maninim aylemametim... ante mogn atihun! let's follow our Lord and his deciples & resist the force of evil which is trying to diminish our Christian ways. Glory be to the father and to the son and to the Holy spirit. One God. Amen.